OK, one last napkin tutorial. 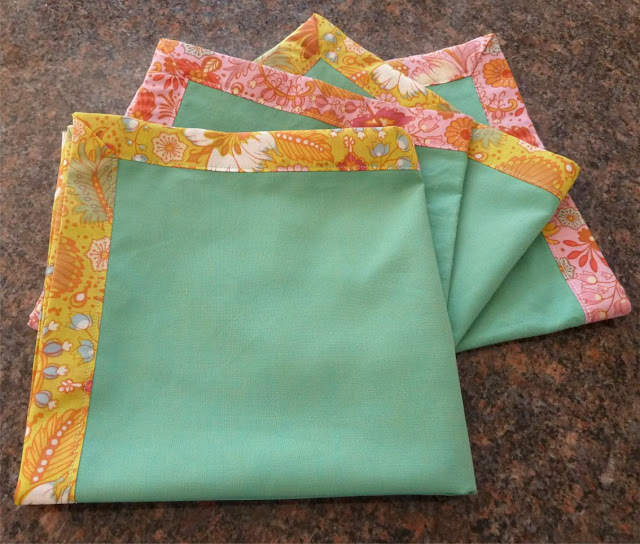 Again, these finished napkins look exactly like these awesome linen napkins from Sew Take a Hike but there was all that folding and pressing I didn't want to deal with. Apparently even when I'm just sewing I'm thinking quilting because these are done similarly to how I bind my quilts. Finished size 18". Cut the ends of your 4" strips at a 45° angle. Using a 1/4" seam allowance, sew strips together end to end. You will need to offset the edges by 1/4" inch. Press open your seam allowance. Press your strip in half lengthwise, wrong sides together. Press one side in half again bringing the raw edge up to the first fold line. Place the end of your 4" strip at about the midpoint of your square with the folded edge away from your sewing edge. 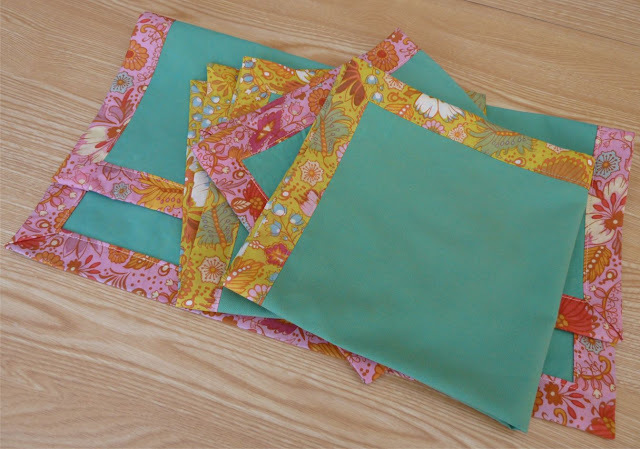 Start sewing about 3" above the bottom of the square with a 1" seam allowance. Sew until you are 1" from the edge of the napkin. Turn your napkin 90° and sew in reverse off the edge of the napkin. Miter the corner by folding the strip up at a 45° angle. Fold the strip back down even with both edges of your napkin. Sew down the side with a 1" seam allowance. Repeat for all 4 sides. Stop sewing about 3" below the last corner. Fold and press the ends of your strips so they just barely meet in the middle of your napkin. On the right side, cut your strip directly in the fold. Unfold the piece you just cut from the right side and line it up on the left with the edge directly on the fold. Cut the left side even with the outer edge of your cutoff piece. In this case that will be 4" from the fold line. Be careful to only cut through the top strip. Fold and press the right side strip down at a 45° angle. 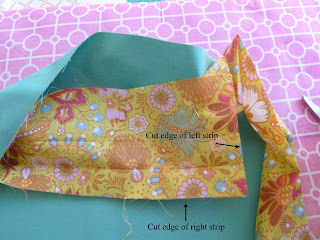 Line up the cut edge of the right side with bottom edge of the right hand strip and sew directly on the fold line. Check that you now have a perfectly fitting continuous strip of binding to stitch down on the final side. If so, trim 1/4" from the sewn line and press your seam open. Sew the remaining binding down with a 1" seam allowance slightly overlapping the end points of your previous seams. Fold your binding over the edge of the square to the back of your napkin. Your square should tuck right into your folds. Miter your corners and pin in place. From the front topstitch around the edges of your napkin just inside the edge of the binding. I wish I had thought to do it this way. It would have saved me A LOT of time. Awesome tutorial and great napkins. I've never thought of making napkins, probably because I got more than I know what to do with before I got married, but some are starting to show some age now, so I might just try sometime. This looks like a great way to avoid having to fold the napkin edges over twice and get neat corners, which I've found is almost impossible. Plus I like the look of the contrasting fabric.